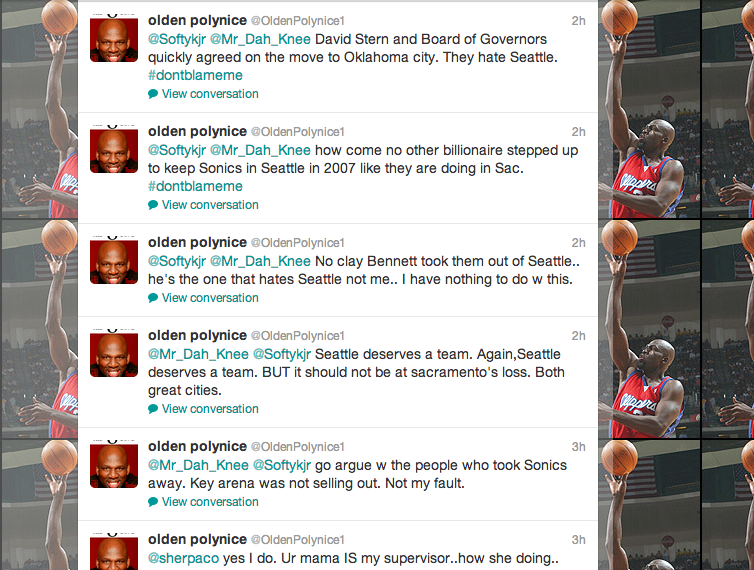 Former Seattle Supersonic Olden Polynice was once a fan favorite in this town. Today? Not so much. Just like the ridiculous Spencer Hawes reaction last weekend, these sort of incidents are often chalked up as examples of how passionate sports fans can be about their teams. They aren't. These are examples of how stupid sports fans can be. Polynice and Hawes both played for NBA teams. They weren't community ambassadors. They weren't public servants. They were employees. Hawes did not choose to work in Sacramento, just like Polynice didn't choose Seattle. They went there because their jobs forced them to. Olden doesn't like Seattle? So what? Sometimes I don't like Seattle, and I've lived here all my life! Whether it's Polynice, Hawes, Nick Collison or your annoying neighbor, most sports fans have pretty strong feelings about their favorite team. And if you don't agree? Tough luck. Don't get mad at O.P. for saying the Kings should stay in Sacramento. Like everyone else, he has a right to root for whoever he wants in this drama. 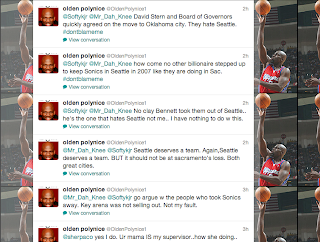 Besides, real Sonics fans know that this is the only reason you should be mad at Olden Polynice. You missed the comments that he made yesterday about the Seattle Fan Base. That was the root of this "discussion"
Did you post my police joke he blocked me on?